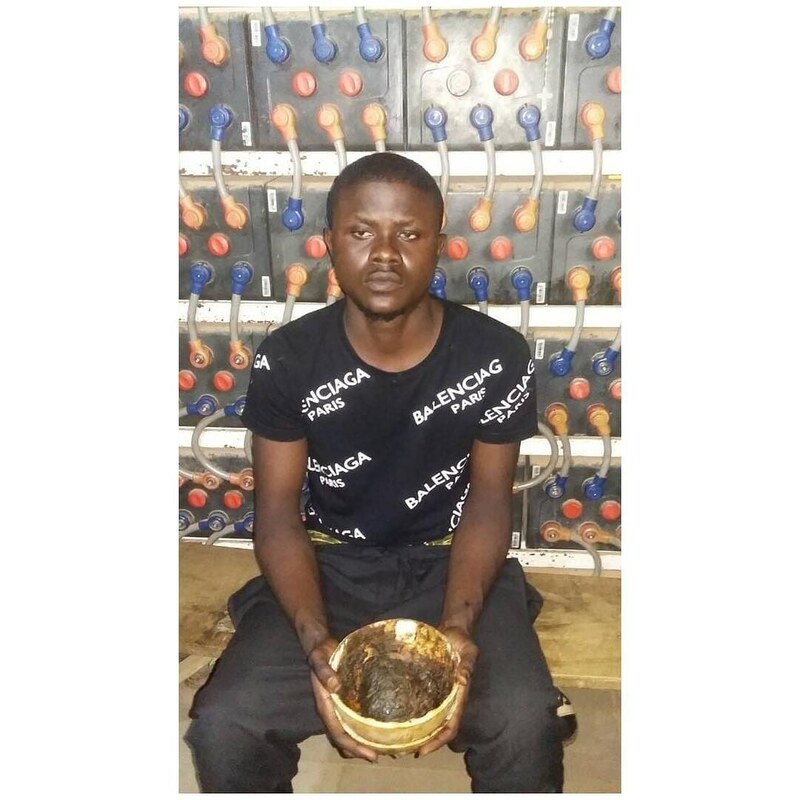 Home Crime news Lagos police arrest son trying to kill his mom for money ritual . Lagos police arrest son trying to kill his mom for money ritual . Ayobo, Lagos, was, on Sunday, greeted with the gory sight of a helpless mother whose face and skull was badly battered by her son in his attempt to advance his cyber fraud business (yahoo) to the ritual level (yahoo plus). The incident took place at No.2 Raji Ajanaku street, Alaja Road, Ayobo,, inside the flat the suspect,Taiwo Akinola, 29, lives with his mother, Mrs Alice Iyabo Akinola, and her grandchild, Master Faruk, age 14 years. . In a carefully thought out plans to kill his mother, Taiwo, said to be staunch member of the notorious Aiye confraternity, went to the victim's provision store in front of their apartment and told his mother to meet him inside the house for an important discussion and at same time sent his nephew, Faruk. to go buy him a white handkerchief and a stick of cigarette. As soon as the victim entered the house, the suspect attacked her, smashing her head with a plank, pressing iron and a UPS charger, to ensure she didn't survive the ferocious attack. . When Faruk returned from the errand, he didn't see his grandmother in the shop, so he went into the house only to see the poor woman lying in a pool of blood. Shocked by what he saw, the small boy raised the alarm which attracted neighbours to the scene. . The police was informed and Taiwo promptly arrested. The victim was rushed to an undisclosed hospital for treatment and was found to be hanging onto life. Right now, the doctors are battling to revive unconscious Alice? During a brief interrogation, the suspect disclosed that he was asked to kill his mother in order to have more money. When his room was searched, the following exhibits were recovered: .